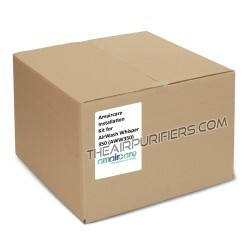 Amaircare 350 (AWW-350) AirWash Whisper is the entry level Amaircare Airwash Whisper installed air purifier. 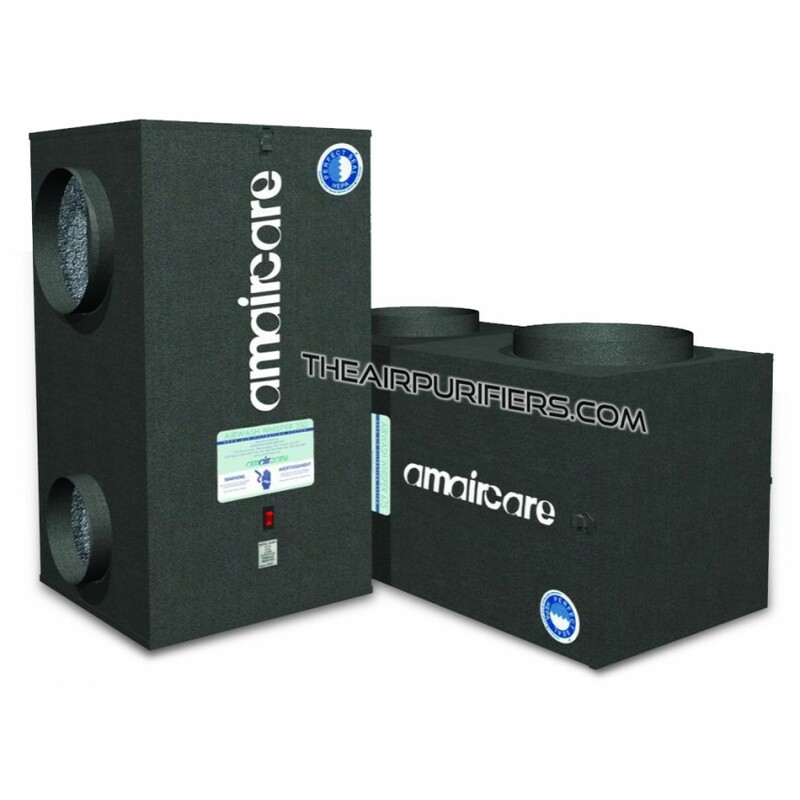 Amaircare 350 AirWash Whisper employs the Amaircare Extra large True HEPA filter, the standard or optional activated carbon filter and a powerful integrated Motor/Fan. This makes Amaircare 350 AirWash Whisper an effective dust, allergens, regular chemicals, VOCs and Specific chemicals remover in a small to medium size houses or office areas under 2625 sq. ft.
Amaircare 350 AirWash Whisper uses the existing house air duct to deliver a continuous supply of clean air to every room. 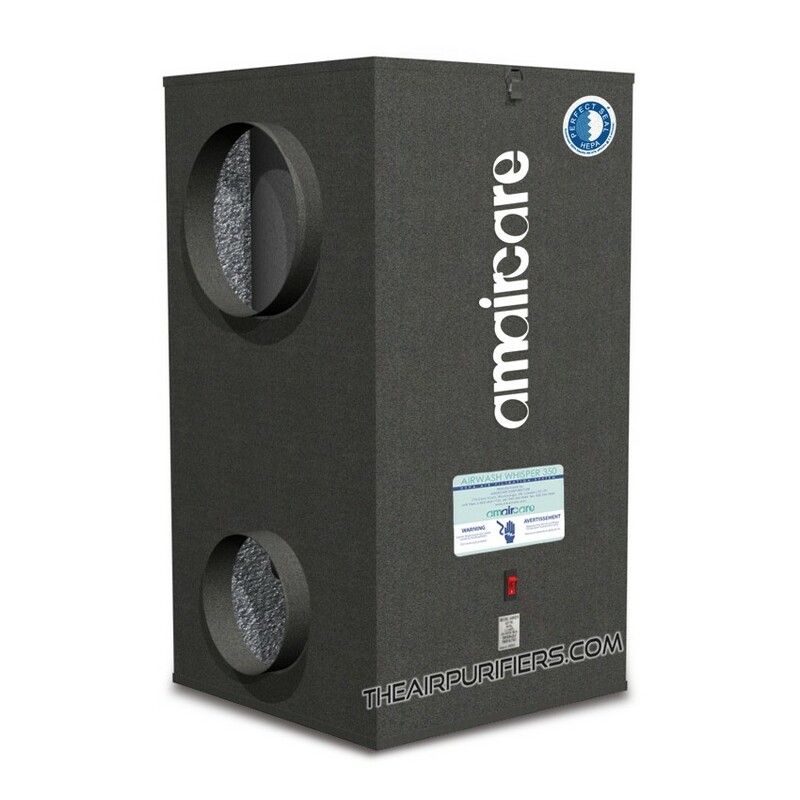 Amaircare 350 AirWash Whisper employs large True HEPA filter and Carbon filters to provide a complete air filtration from all types of air contaminants and pollutants. 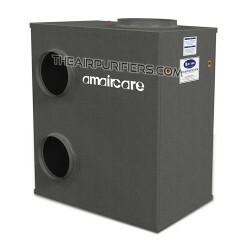 Amaircare 350 AirWash Whisper employs oversize True HEPA filter with 100 sq. ft. of HEPA media for Large scale allergens and dust removal. Amaircare 350 AirWash Whisper offers Carbon filter upgrades for a higher chemical and odor removal rate. The Top-load design of the Amaircare 350 AirWash Whisper filter compartment ensures that filters are easy to access and replace. Amaircare 350 AirWash Whisper installs in the basement, the utility room or in the attic - completely out of the way and out of sight. Amaircare 350 AirWash Whisper is independently powered and keeps circulating the air even with the furnace's fan turned Off. Amaircare 350 AirWash Whisper promotes more even air temperature and humidity levels throughout the whole house. The Amaircare 350 AirWash Whisper connected as a bypass, does not impact the HVAC performance and does not affect its warranty. Amaircare 350 AirWash Whisper features a fully insulated construction with soundproof liner for quiet operation and protection from temperature fluctuations. 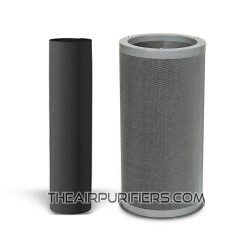 Amaircare 350 AirWash Whisper incorporates a Perfect Seal design of air filtration system with Easy-Twist HEPA filter to eliminate polluted air bypass. Amaircare 350 AirWash Whisper comes with 5-Year manufacturer's warranty. There is NO US Sales Tax on the Amaircare 350 AirWash Whisper purchases. Amaircare 350 AirWash Whisper - How It Works? 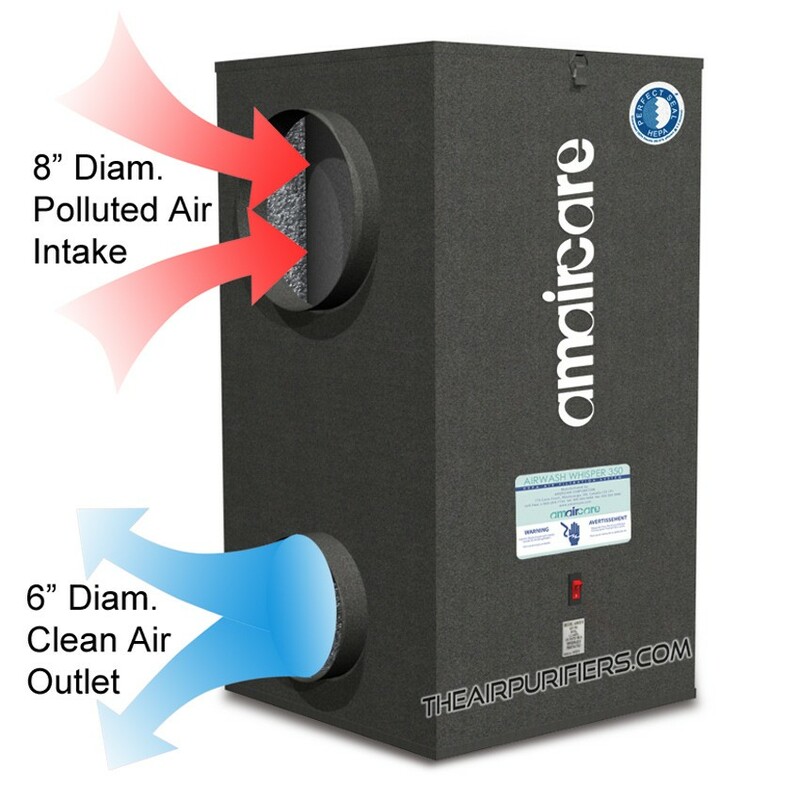 Amaircare 350 (AWW350) AirWash Whisper installed air purifier can be integrated into the existing house's HVAC system or installed and run fully independently. As integrated air filtration system, the Amaircare 350 AirWash Whisper installs next to the house's HVAC system (air handler) in a basement, in a utility room or in attic. The Amaircare 350 AirWash Whisper is connected to the return section of house's existing air duct as a by-pass. The Amaircare 350 AirWash Whisper draws the portion of the return air (about 30% to 50%) through the air filtration system, cleans it from all air pollutants and air contaminants and then returns it back into the air duct for further distribution throughout the entire house. Amaircare 350 AirWash Whisper - When to Use? 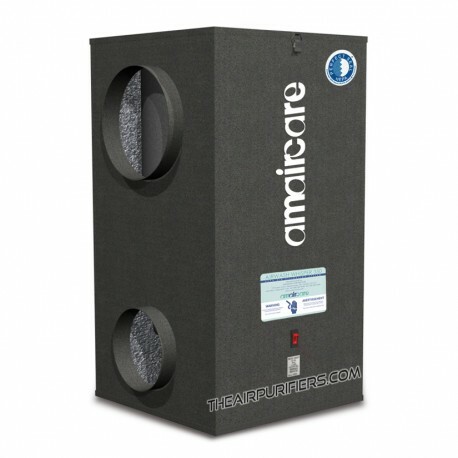 Amaircare 350 AirWash Whisper air purifier with a standard True HEPA and carbon blanket filters provides and effective purification of the air from all solid airborne contaminants (allergens, dust, etc.) and most regular chemicals and household odors. The available optional VOC Canister with 100% Carbon or proprietary 'Formaldezorb' adsorbent can be used for effective removal of VOCs, formaldehyde, chemicals in high concentrations, cigarette smoke and strong odors. 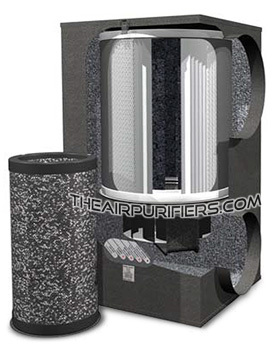 The Amaircare 350 AirWash Whisper air filtration system consists of the following filters. 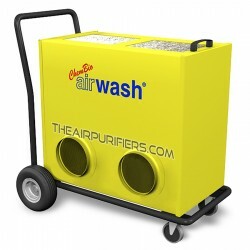 Amaircare 350 AirWash Whisper employs the foam pre-filter as the first stage of air filtration system. Wrapped around the HEPA filter, the foam pre-filter captures large dust and dirt particles, while protecting fine True HEPA filter from fast contamination and extending its lifetime. The foam pre-filter's lifetime - up to 12 months. 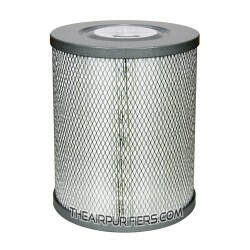 The single Foam pre-filter is included into Amaircare 350 AirWash Whisper Standard or Plus Annual Filter kits. 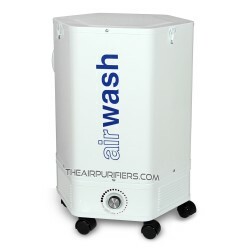 The Amaircare 350 AirWash Whisper features the oversize 16-inch tall True HEPA filter of 'Easy-Twist' design. 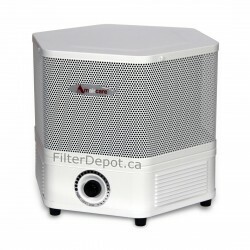 The oversize True HEPA filter contains a massive 100 sq. ft. of 99.97% certified True HEPA filter media. 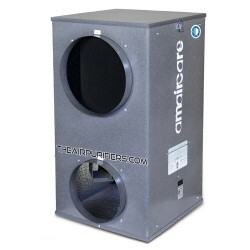 This 'JUMBO' size True HEPA filter makes Amaircare 350 AirWash Whisper a True powerhouse in effective and long-lasting removal of all microscopic allergens, dust, cigarette smoke and other airborne contaminants. The HEPA filter features the Amaircare's proprietary Easy-Twist HEPA filter design. 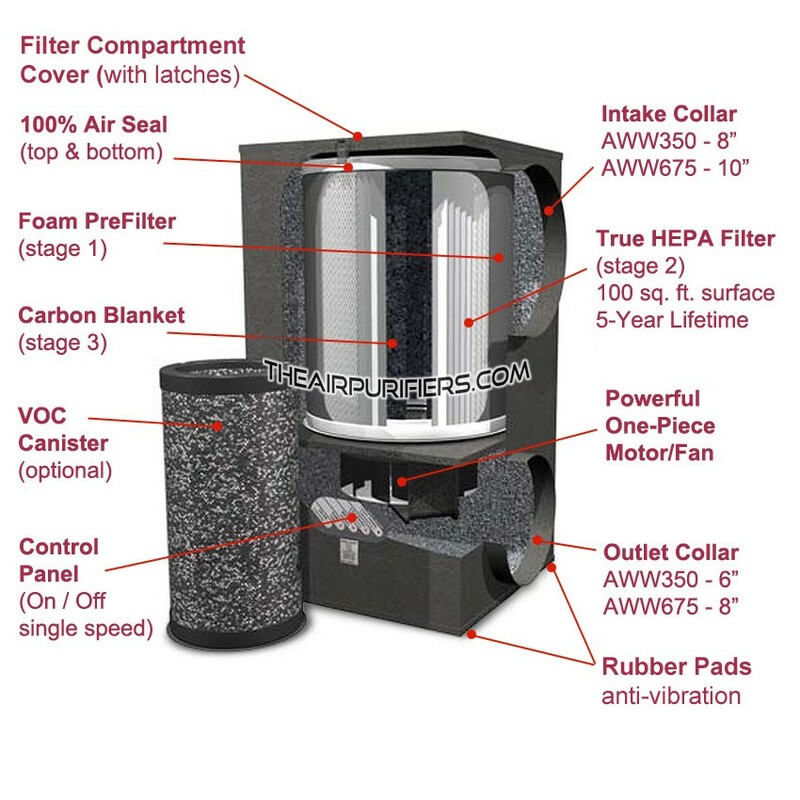 The 'Perfect-Seal' HEPA filter vacuum seals the filter compartment and guarantees that no air passes by the HEPA filter. The Oversize True HEPA filter has a long lifetime - 3 to 5+ years under normal conditions. The standard carbon blanket filter is a 1/2-inch thick non-woven polyester based filter imbued 200% with Activated Carbon. It is placed in the center opening of the True HEPA filter and guarantees an adequate adsorption of most household chemicals and odors, including cigarette smoke, cuisine odors, pet odors, etc. 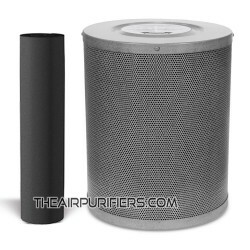 A set of 2 replacement Carbon blanket filters is included with Amaircare 350 AirWash Whisper Standard Annual Filter Kit. The optional VOC Canister with 100% Carbon is available upgrade. The VOC canister contains 6 lbs (2.72 kg) of 100% Granulated activated carbon and allows to achieve a higher rate of adsorption of hazardous VOCs and other dangerous chemical substances released by household cleansers, paints, carpet, wallpaper, furniture, consumer electronics, cigarette smoke, etc. 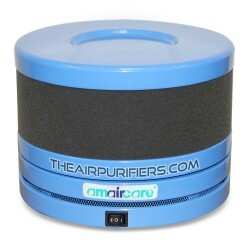 Amaircare 350 AirWash Whisper can be ordered with optional VOC Canister with 100% Carbon. 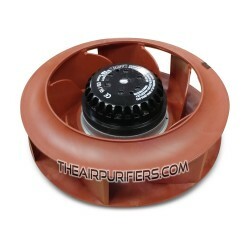 A single replacement VOC canister is included with Amaircare 350 AirWash Whisper Plus Annual Filter Kit. The VOC Canister with 'Formaldezorb' is filled with 6 lbs. (2.72 kg.) of Amaircare proprietary 'Formaldezorb' adsorbent. 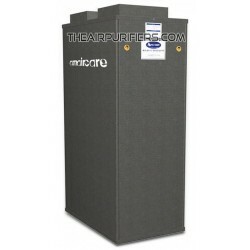 Formaldezorb adsorbent significantly increases the ability of Amaircare 350 AirWash Whisper air purifier to remove Formaldehyde, VOCs, pesticides and other specific chemicals. The lifetime of VOC canister with Formaldezorb - up to 12 months. A single Formaldezorb VOC canister is included into Amaircare 350 AirWash Whisper Plus Annual Filter Kit with 'Formaldezorb'. 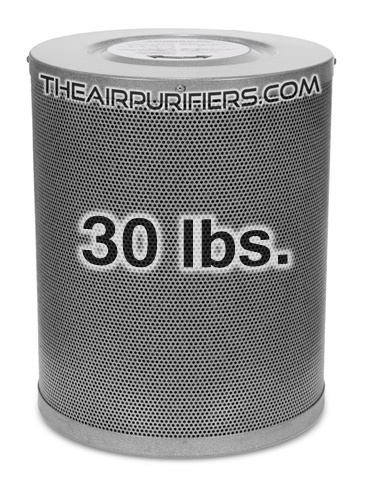 The ULTRA VOC canister contains a colossal amount (30 lbs. / 13.6 kg) of 100% Activated Carbon adsorbent. Such a massive amount of adsorbent combined with an extended dwelling time in 2.5-inch deep carbon bed renders the unparalleled adsorption capacity in removal of most hazardous VOCs, dangerous chemical substances, heavy cigarette smoke and other chemicals in high concentrations. A single ULTRA VOC canister is included into Amaircare Ultra VOC Annual Filter Kit. The ULTRA VOC canister can only be installed instead of a True HEPA filter. Therefore, while it boosts the adsorption capacity in removal of heavy chemicals and strong odors, the absence of a True HEPA filter makes the Amaircare 350 AirWash Whisper ineffective in removal of microscopic allergens and dust. The 0-ring gasket used with Easy-Twist True HEPA filter ensures a perfect vacuum seal of the filter chamber and helps completely eliminate the polluted air by-pass. A single O-ring gasket is included with Amaircare 350 AirWash Whisper Standard or Plus Annual Filter Kits. 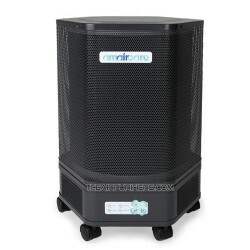 The Amaircare 350 AirWash Whisper air purifier is equipped with a powerful, yet Energy efficient thermally protected insulated motor with centrifugal fan. 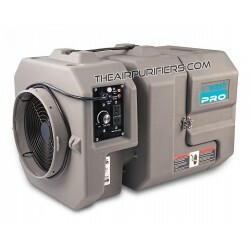 It is rated at 350 CFM (cubic foot per minute) of air flow. The one-piece Motor/Fan assembly is factory balanced to ensure a vibration and noise-free operation. The motor is run tested for 50,000 hours (2083 days or 5.7 years) of continuous operation. The Amaircare 350 AirWash Whisper air purifier has a Single operating speed with On / Off illuminated toggle switch. Amaircare 350 AirWash Whisper in standard configuration comes for 110-120V/60Hz power supply system for North America. The Amaircare AWW-350 is also available for 220-240V/50Hz power system at Extra cost. 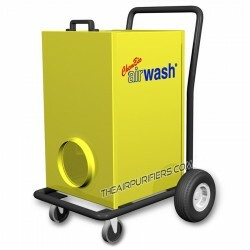 Amaircare 350 AirWash Whisper features durable, impact resistant the all steel housing design of rectangular shape made of 24 gauge cold rolled steel. The durable baked on thermoset powder finish produces No toxic off gassing and is available in a single Meteorite color. The sound absorbing material covers the entire internal surface of the Amaircare 350 AirWash Whisper air purifier housing to reduce noise. 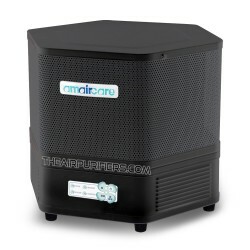 Amaircare 350 AirWash Whisper air purifier is equipped with intake and outlet duct collars to allow for easy connection to the existing air duct using the standard rigid or flexible ventilation hoses. 8-inch Diameter Polluted Air intake Duct Collar at top of the unit. 6-inch diameter Clean Air outlet Duct Collar at bottom of the unit. The two latches hold the top cover on and allow for easy access to the filter compartment. The top-load filter compartment design makes the filter replacing procedure fast and easy, which is especially important for elderly people or individuals with limited physical abilities. Fully Assembled (Heavy VOC canister can be shipped in a separate box). With full set of Filters (per model specification). Requires DIY of professional connection to the return air duct of house's HVAC system. Amaircare 350 AirWash Whisper air purifier ships Free by UPS or FedEx Ground delivery services in Continental USA and Canada. The faster alternative delivery services are available at a cost (will be displayed in the shopping cart). The entire content of the shipment has to be inspected for possible damages or problems upon arrival. If the problem is found, it has to be reported to the driver of the courier company and to our company's Customer Service without a delay to schedule its prompt replacement. The units that are found Damaged or Defective upon arrival and properly reported, will be promptly replaced with new one Free of Charge.